Just in time for next week’s start of Big West Conference play, Hawai’i found its shooting touch Thursday night and used it to race past visitng Delaware State, 77-66, in nonleague action. A spirited and entertained “White-Out” crowd of about 3,800 at the Stan Sheriff Center watched Jack Purchase tie a season-high with 21 points, including five 3-pointers, and Sheriff Drammeh add 12 points to help the Warriors improve to 6-7 entering next Thursday’s Big West opener at Cal State Fullerton. The Hornets fell to 3-12. Both teams put on an impressive 3-point shooting exhibition, especially in the first half when UH connected on 9 of 20 attempts (45 percent) from beyond the arc and Delaware State drained 5 of 13 (38.5 percent). Purchase broke a 19-19 tie with a driving layup with 10:31 remaining in the first half, igniting a 10-2 run capped by Drammeh’s 3-pointer from the right corner with 8:15 left that pushed the Warriors ahead, 29-21. The Hornets closed it to 32-27 on Devin Morgan’s 3-pointer with 5:12 remaining, but Ido Flaisher’s putback started the Warriors on a 9-0 run to end the half with a 41-27 lead. UH made 16 of 30 (53.3 percent) field goals overall in the first 20 minutes, out-rebounded Delaware State 16 to 9 and committed just five turnovers while making four steals. 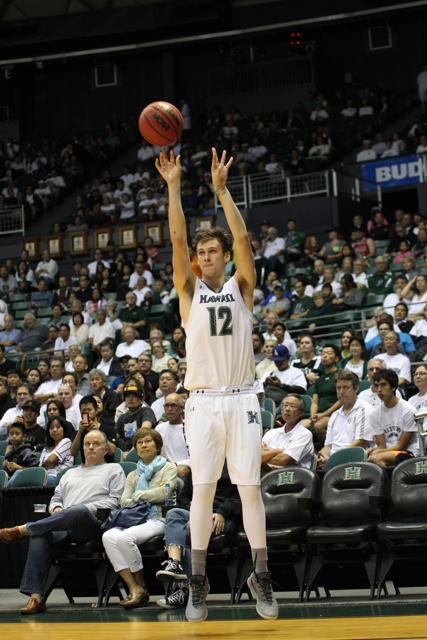 Hawai’i then began the second half with a 7-2 run capped by Gibson Johnson’s layup off Purchase’s assist that made it 48-29 with 17:36 left, and the Hornets did not get within striking distance thereafter. A pull-up jumper by Artem Tavakalyn closed it to 68-56 with 2:24 remaining, but Larry Lewis Jr.’s three-point play with 1:34 left completed a 7-0 surge by the Warriors to make it 75-56 and seal the victory. Freshman guard Leland Green added 11 points, including 3-of-6 shooting from 3-point range, and point guard Brocke Stepteau added 10 points and four assists for the Warriors. 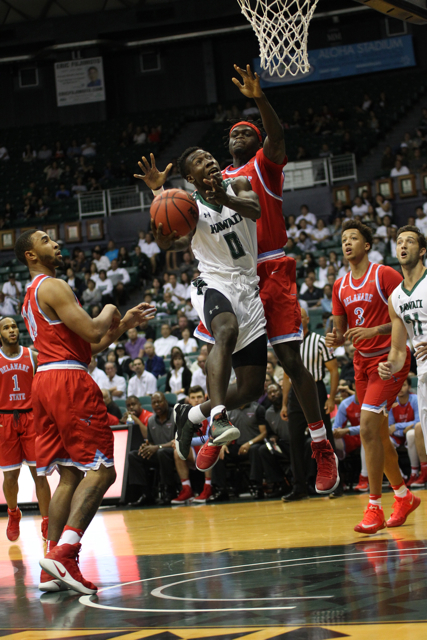 For the second consecutive game, Hawai’i used a starting lineup that featured three guards (Stepteau, Drammeh and Green) alongside forwards Purchase and Johnson. 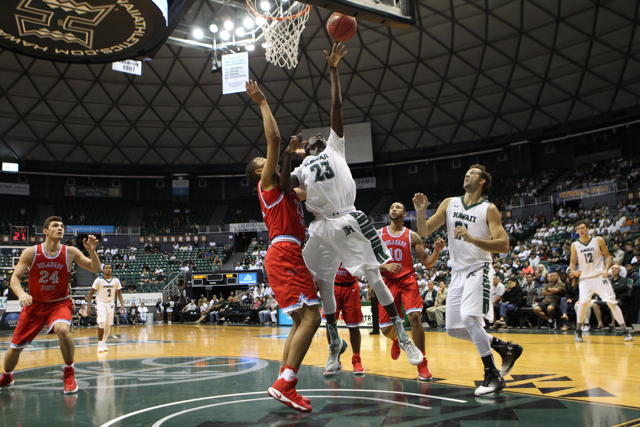 Hawai’i out-rebounded Delaware State, 35-21, with Purchase grabbing a season-high eight. The Warriors shot a respectable 46.3 percent from the field, but the Hornets actually were better at 47.8 percent. Ganot said his team still has much work to do over the next week in preparation of Big West play. Morgan finished with a game-high 26 points for the Hornets, and DeAndre Haywood added 16. Big West is rated as the the 28th ranked conference in terms of RPI, out of 32 conferences. Last year, the BW ended up as the 16th ranked conference. Texas St and Troy are in the Sun Belt which is ranked 13th .